We invite you to kick-start the season of giving by participating in our Crusade for Excellence. This year, our goal is to raise $40,000 through our Crusade. Your gift, large or small, will make a huge difference in the lives of our students. CLICK HERE for more information & to make your donation online. It is critically important to remember that All Saints is a not-for-profit organization that cannot survive without the support of our All Saints community. Tuition dollars alone do not fund the costs of operating the school. 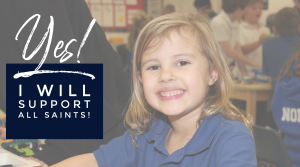 You gift will help us continue our mission of providing our students an education that teaches values, responsibility and the traditions of the Catholic faith.